The cdsingle is available through Actual records and BeaRecords and in the shops in Andorra & Catalonia. La Teva Decisió - demo version in Catalan is still available at the same website. Danish born Susanne Georgi is a member of Me & My (with her sister Pernille) who scored a world wide hit with Dub I Dub. They were also Big In Japan where they sold over 2 million records.Me & My tried in the Danish national selection of 2007 with Two Are Stronger Than One. Susanne also announced the Danish votes that year in Helsinki. 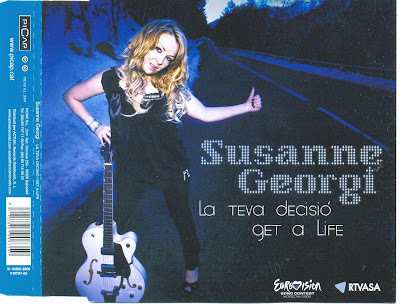 Me & My released their hits on the CD The Ultimate Collection in 2007.
http://www.eurovisionandorra.ad/ has more info and you can download all (3) preselection songs under downloads. The site is in Catalan and English. Note this chart does not include downloads and not many cdsingles are released in Spain. Have you visited these yet?